For the first time in United States history, a presidential candidate was seen posing at a rally with a Muslim woman. 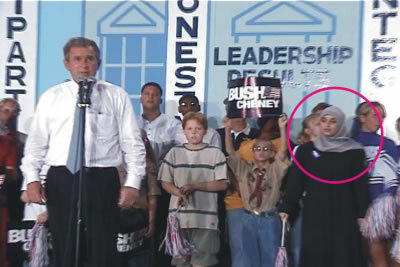 Governor George W. Bush posed with a Muslim woman as he delivered a powerful speech to a crowd of over 13,000 in Toledo, Ohio. Muslims have been rallying in support of Governor Bush’s campaign and will likely vault him into office.